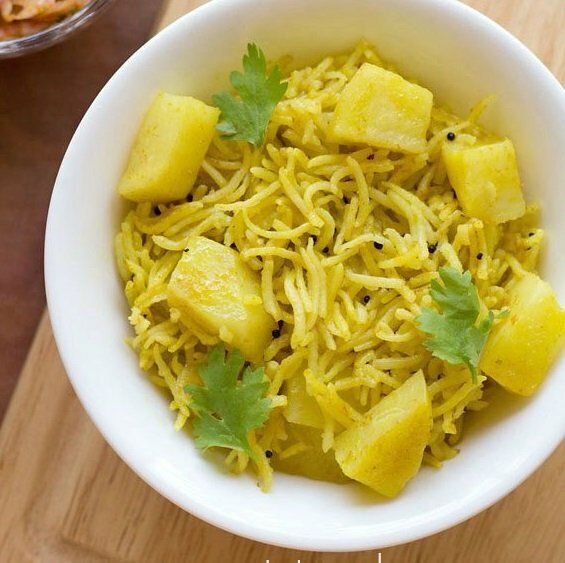 potato rice or potato pulao is a simple and minimally spiced rice dish made with potatoes. 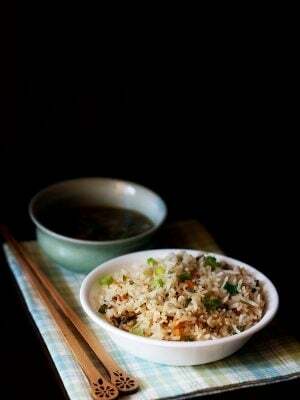 potato rice recipe with step by step photos. this potato rice or potato pulao is a simple and minimally spiced rice dish made with our favorite ingredients – rice and potatoes. 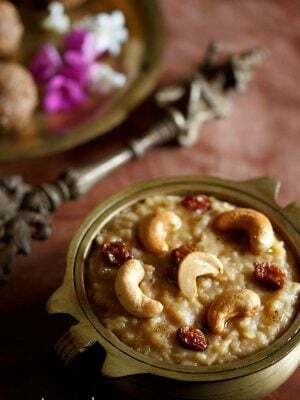 pulao or pulav or pilaf is one recipe that is regularly prepared at home. reason being it gets done in less time and the preparation also is quick. 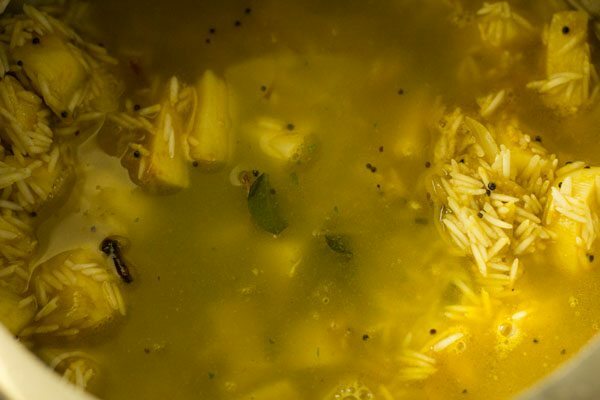 this is one of those rice recipes that you fall back on when you do not have veggies. 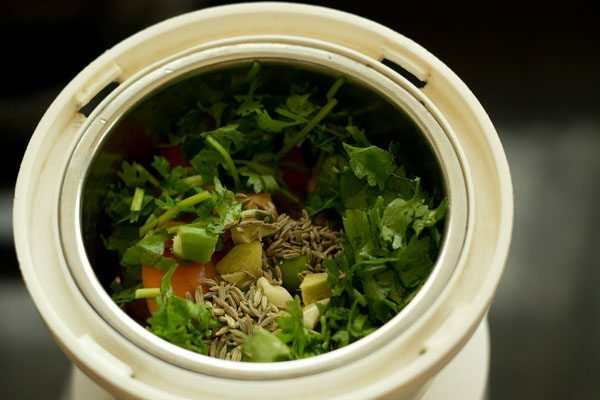 but you do have rice, potatoes and the regular indian spices-herbs in your kitchen. the recipe is easy to prepare. for a variation you can also include some peas, carrots, beetroot and sweet corn in this aloo pulao. in the recipe post, i have cooked potato rice in a pressure cooker, but you can also cook them in a pot or pan. i have mentioned the details in the notes section of the recipe card below. or you can check this veg pulao recipe which is made in pot and i have shared step by step photos to make pulao in a pot or pan. 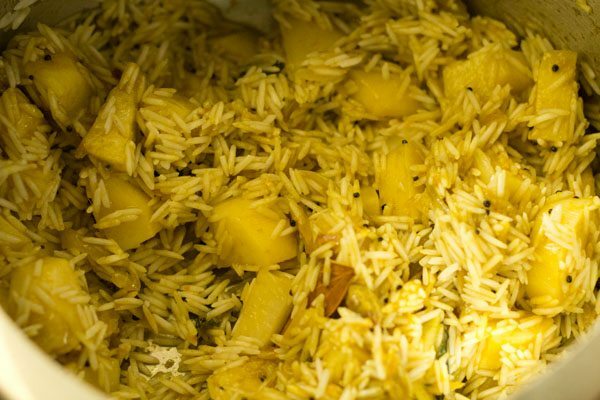 you can serve potato rice with a side pickle, salad or raita. this pulao also makes for a tiffin box lunch. then soak the rice in water for 30 minutes. then later, drain all the water from the rice and keep aside. 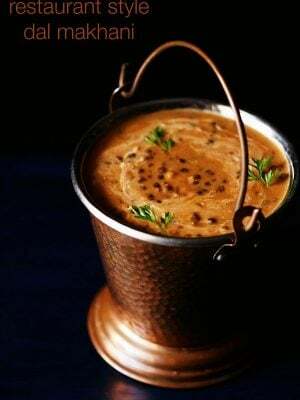 in a chutney grinder jar or a small grinder jar, take the following ingredients - ⅓ cup chopped tomatoes, 3 to 4 small to medium garlic cloves (chopped), 1/2 inch ginger (chopped), 1 or 2 green chilies (chopped), 1/4 cup chopped coriander leaves, 1/4 teaspoon fennel seeds and 1/4 teaspoon cumin seeds. without adding any water, grind to a smooth paste. the juices from the tomato will help in grinding. 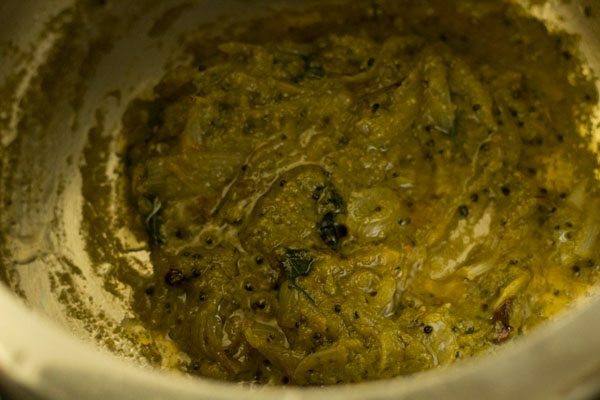 keep this masala paste aside. heat 2 tablespoon oil in a pan. 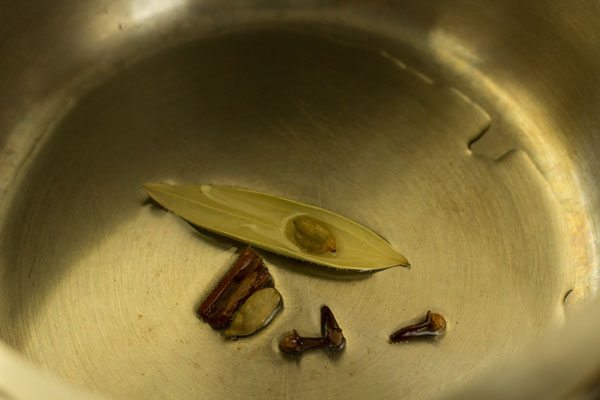 lower the flame and first add the whole spices - 1 tej patta, 2 green cardamoms, 3 cloves and 1/2 inch cinnamon. next add 1/4 teaspoon mustard seeds. saute till the mustard seeds splutter. then add 1/3 cup thinly sliced onions. saute the onions till they begin to get light brown. then add 8 to 10 curry leaves. saute for 5 to 6 seconds. then add the ground masala paste. add 1/4 teaspoon turmeric powder. 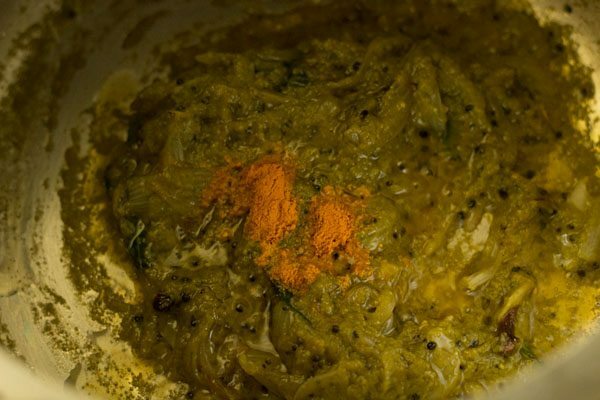 mix the turmeric powder very will with the rest of the masala. add chopped potatoes. 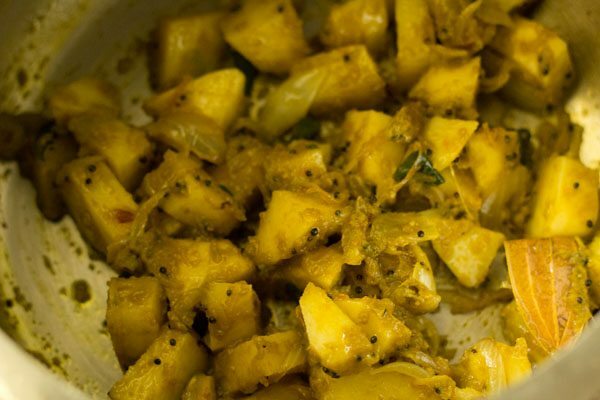 stir and mix the potatoes with the rest of the pulao masala. now add the rice. stir and mix the rice evenly with the masala. add water. you can add 1.5 cups to 1.75 cups of water. do add water depending on the quality of basmati rice. stir very well. season with salt. check the taste of the water and it should taste a bit salty. cover and pressure cook potato pulao on a medium flame for 2 to 3 whistles or 6 to 7 minutes. when the pressure comes down on its own, open the lid and gently fluff the potato rice. 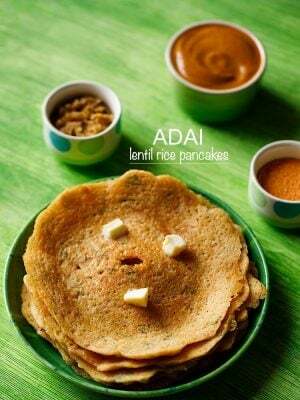 garnish with some coriander leaves or mint leaves while serving potato rice. 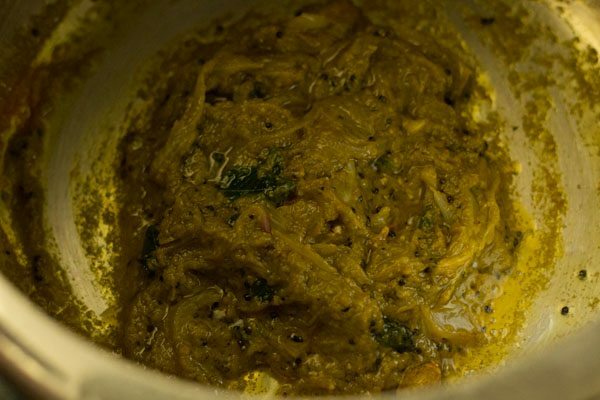 accompany a raita, salad or pickle by the side. 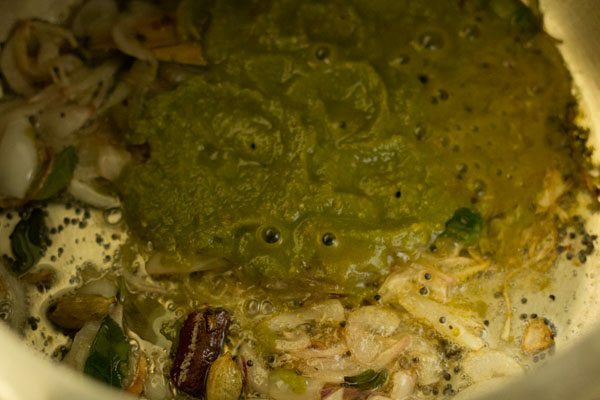 saute everything as mentioned in the recipe in a thick bottomed pan or pot. add soaked rice and then 1.75 cups water. 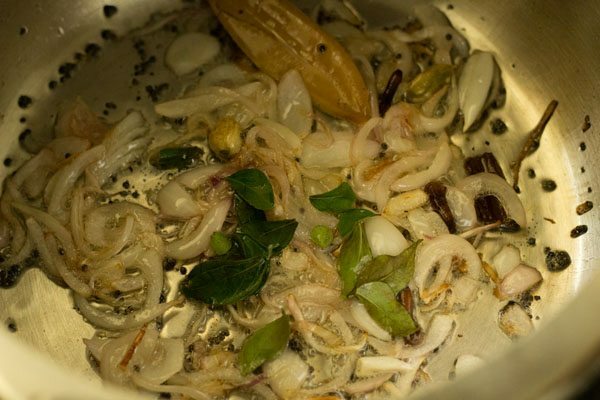 on a low to medium flame, cover and cook till all the water is absorbed and the rice is cooked. depending on the quality of rice, you can add 2 cups water too. 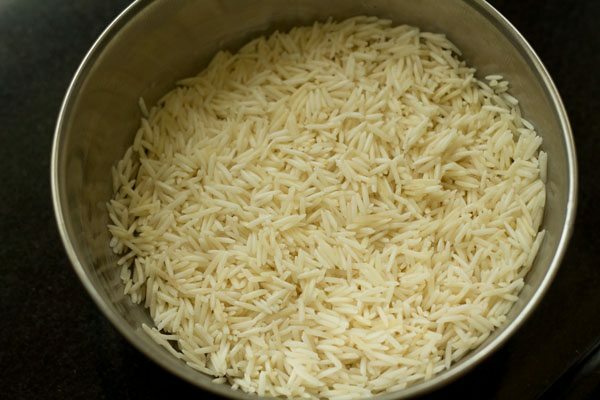 1. rinse 1 heaped cup basmati rice very well in water till the water runs clear of starch. then soak the rice in 1.5 cups water for 30 minutes. after 30 minutes, drain all the water from the rice and keep aside. 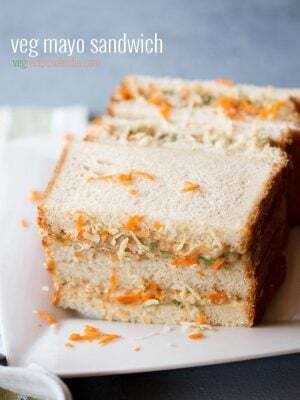 2. in a chutney grinder jar or a small grinder jar, take the following ingredients – ⅓ cup chopped tomatoes, 3 to 4 small to medium garlic cloves (chopped), ½ inch ginger (chopped), 1 or 2 green chilies (chopped), ¼ cup chopped coriander leaves, ¼ teaspoon fennel seeds and ¼ teaspoon cumin seeds. 3. without adding any water, grind to a smooth paste. the juices from the tomato will help in grinding. 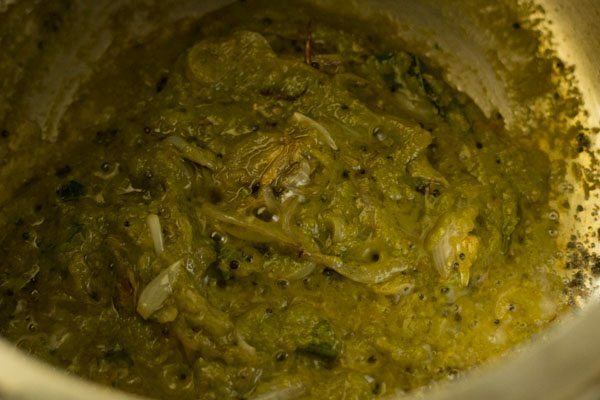 keep this masala paste aside. 4. heat 2 tablespoon oil in a pan. 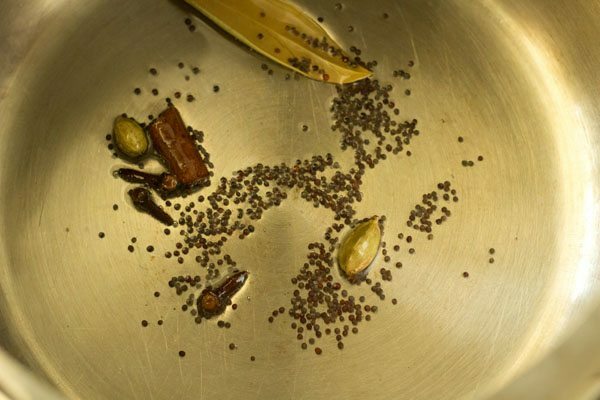 first add the whole spices – 1 tej patta, 2 green cardamoms, 3 cloves and ½ inch cinnamon. 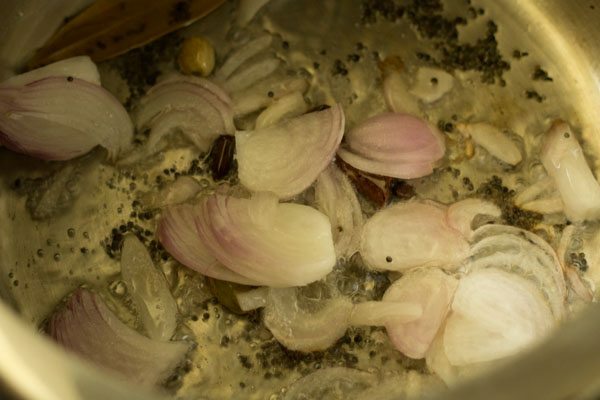 5. next add ¼ teaspoon mustard seeds. saute till the mustard seeds splutter. 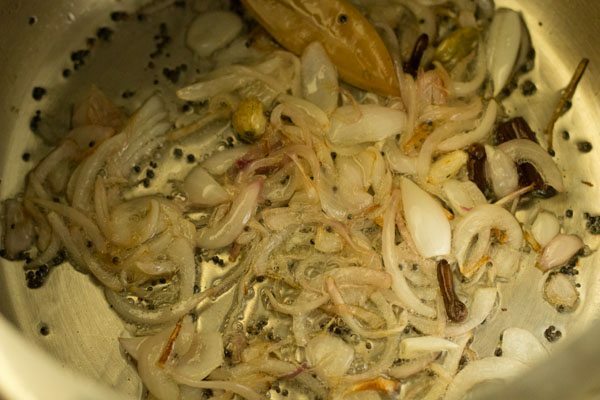 6. then add ⅓ cup thinly sliced onions. 8. then add 8 to 10 curry leaves. saute for 5 to 6 seconds. 9. then add the ground masala paste. 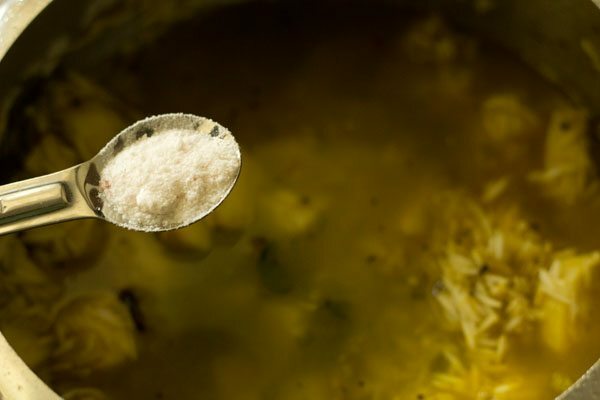 12. add ¼ teaspoon turmeric powder. 13. mix the turmeric powder very will with the rest of the masala. 14. add chopped potatoes. 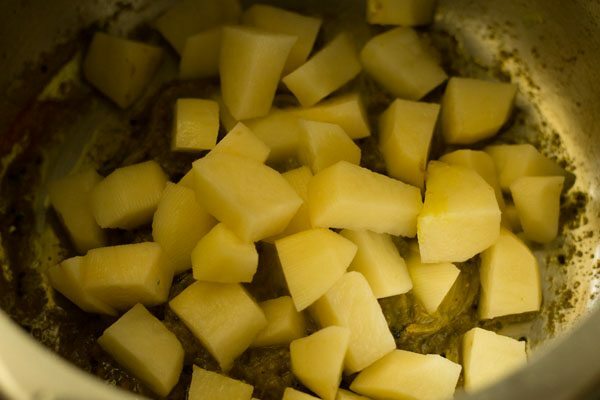 2 medium to large potatoes (chopped in cubes), about 200 to 215 grams of potatoes. 15. stir and mix the potatoes with the rest of the pulao masala. 16. now add the rice. 17. stir and mix the rice evenly with the masala. 18. add water. you can add 1.5 cup to 1.75 cup of water. do add water depending on the quality of basmati rice. stir very well. 19. season with salt. check the taste of the water and it should taste a bit salty. 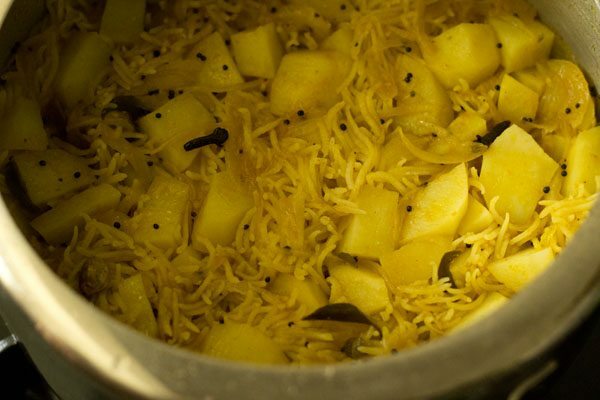 20. cover and pressure cook potato pulao on a medium flame for 2 to 3 whistles or 6 to 7 minutes. 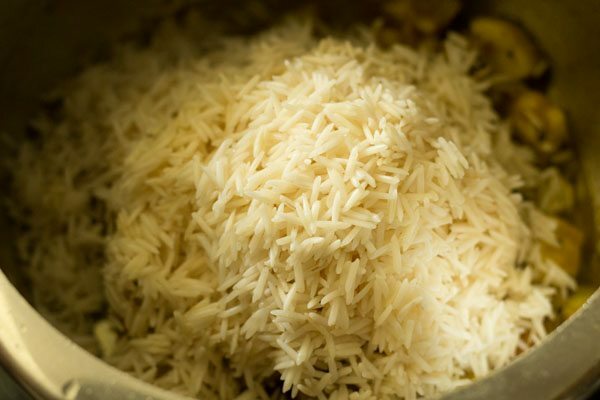 when the pressure comes down on its own, open the lid and gently fluff the potato rice. 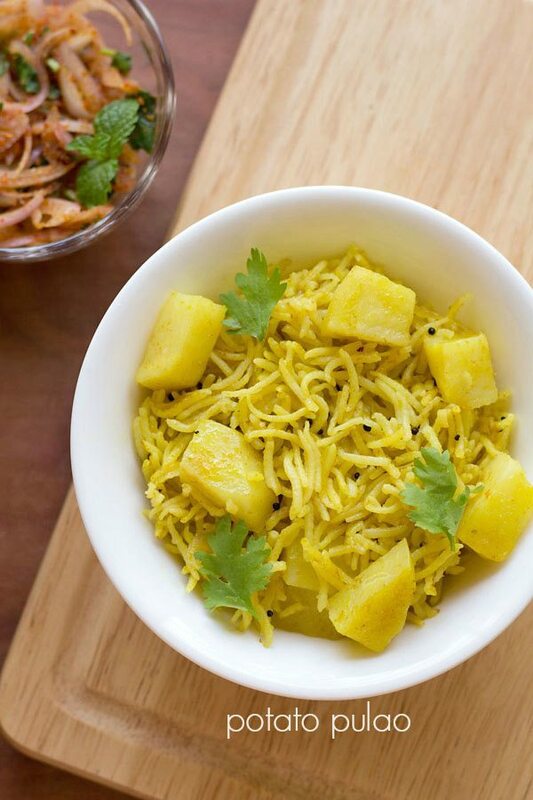 21. garnish with some coriander leaves while serving potato pulao. 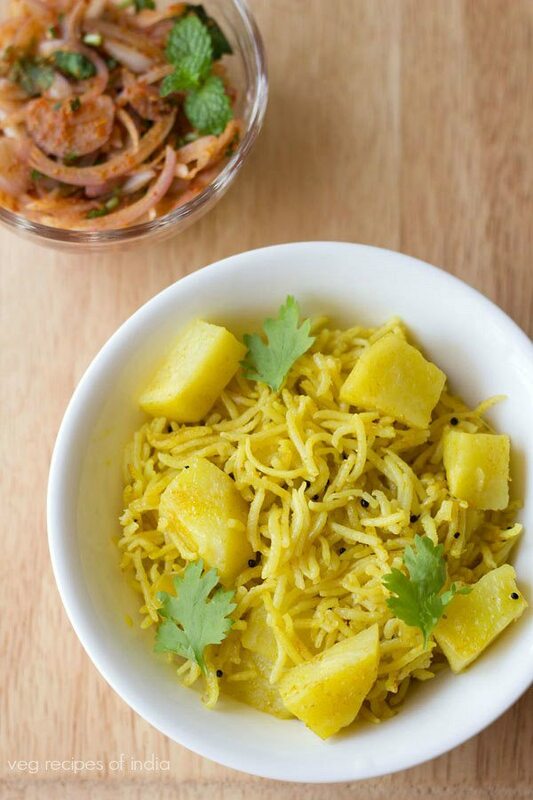 serve potato rice with a onion raita, salad or pickle by the side. When I cooked the dish, i followed the instructions – but the potatoes were not cooked at all by the end. Should I par-boil the potatoes before cooking in future? okay. usually the potatoes cook well. 2 to 3 whistles if enough for chopped potatoes to cook properly. also depending on the quality of potatoes, they may take more time to cook. at times i have this issue with cauliflower that i get here. 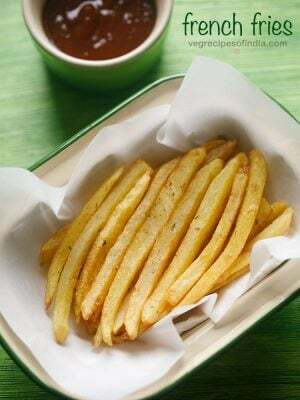 you can parboil the potatoes or chop them in small cubes. both the methods will work. 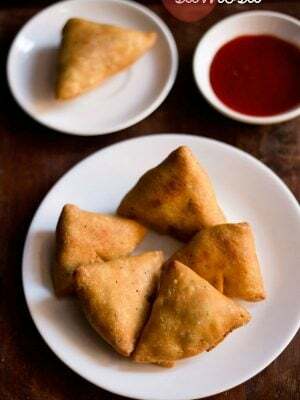 can i use jeera powder in the masala paste because whole jeera will not grind well in my grinder. yes you can do this way too. so jeera powder can be used instead of whole jeera. 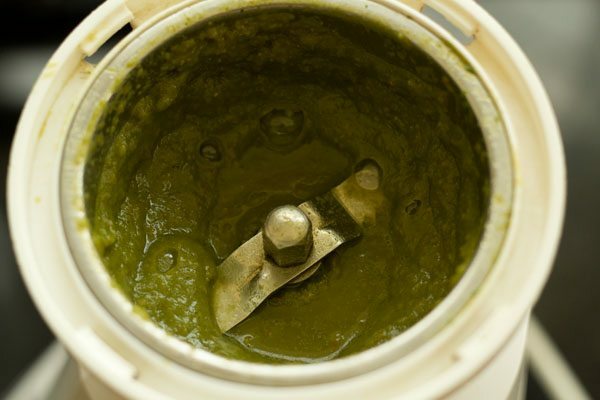 apeksha, just add more green chilies while grinding or use hot green chilies. Super Pulav. Very yummy . Best biryani ever tasted with potatoes . U rock . 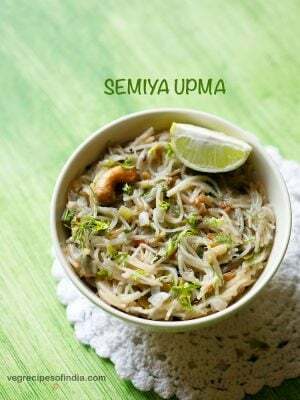 thanks a lot vijaya for this awesome feedback on potato pulao recipe. first time I try to cook pulao. Sounds delicious. Must say the girls will flip for it.